This chapter is among the few Psalms that make explicit reference to the context in which they were written. The opening verse informs us that David composed this chapter when he was approached by prophet Natan after his sin with Batsheva. As we read in the Book of Shemuel II (chapter 12), God sent Natan to David to condemn his sin and to warn of the harsh punishment he will endure as a result ("the sword shall not leave your household forever" – Shemuel II 12:10). 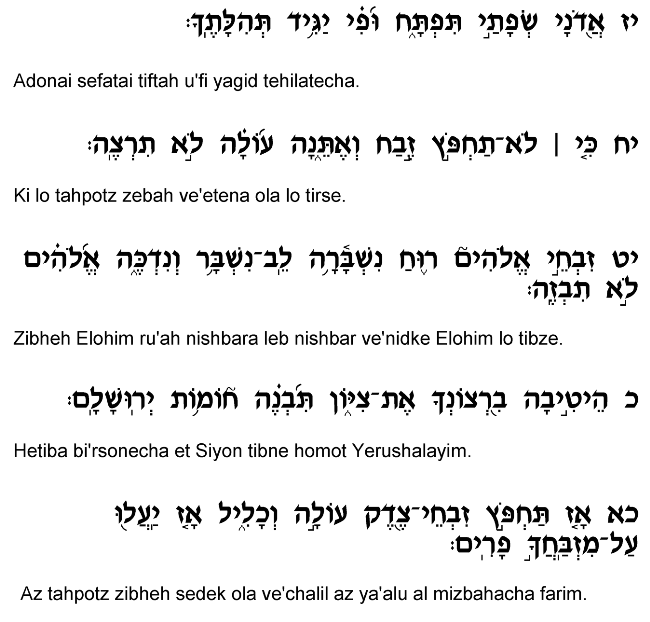 Upon hearing Natan's prophecy, David composed this stirring prayer begging the Almighty to forgive his wrongdoing. David's prayer consists of a number of noteworthy elements, most prominently, perhaps, the emphasis on the theme of "cleansing." He begs not merely for forgiveness, that he escape punishment, but also that he be "laundered" and "purified" from his sin (see verses 4,9). 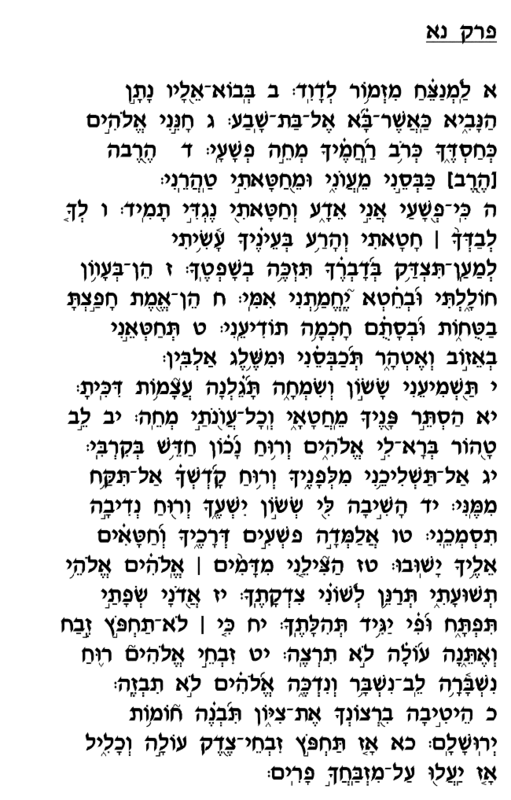 In fact, he asks for purification with "hyssop" (verse 9), which, as Rashi notes, refers to the purification process of a Metzora (leper) which included a hyssop (see Vayikra 14:4) and was required before the Metzora may enter the Mikdash. David recognizes that his misdeed not only renders him worthy of punishment, but also leaves an impression upon his soul; it hampers his ability to reach greater spiritual heights, just as a Metzora's condition bars him from entering the Temple. He thus beseeches God for not only forgiveness, but for purification, for the complete eradication of the sin's effects from his being so that he can continue his life of sanctity and Godliness. As he famously prays in verses 12-13, "Create for me a pure heart, O God, and renew within me a proper spirit. Do not cast me away from You, and do not take from me Your sacred spirit." David also declares as part of his plea, "I shall teach betrayers Your ways, and sinners shall return unto You" (verse 15). Rashi and Radak explain this to mean that the forgiveness granted to David shall serve as inspiration for all sinners of all future generations, who will learn from his experience about the immense power of repentance. David understands full well the prominent place he has attained in Jewish history, that everything he does and that happens to him will be carefully studied for generations to come. He therefore appeals to God that for the benefit of all Jews for the rest of time, God should accept his repentance and thereby establish an inspiring precedent for all future sinners to follow. Towards the end of this Psalm, David proclaims that God is interested less in sacrificial offerings that in sincere, wholehearted repentance: "The offerings of God are a broken spirit, a broken and sorrowful heart – God will not reject" (verse 19). 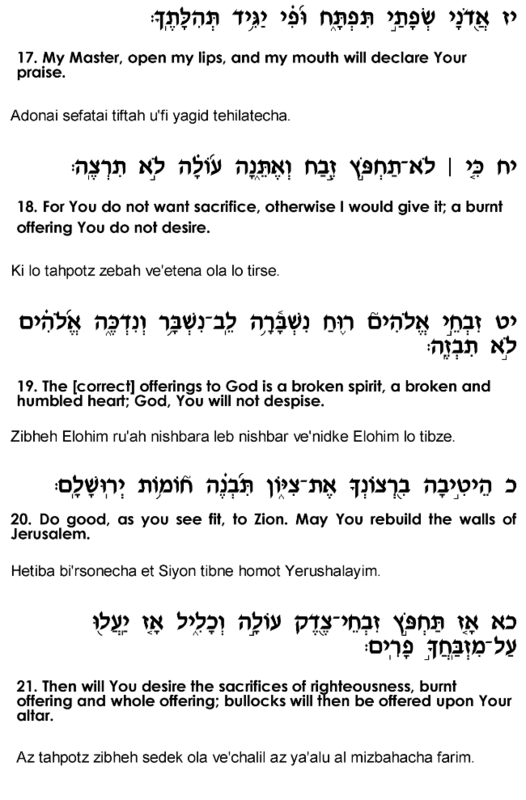 This, too, is likely intended for us, the readers and students of Tehillim who do not have the ability to offer sacrifices, reminding us that the true "sacrifice" is made by the heart, through genuine Teshuva. Even in the absence of the Temple, sinners can earn atonement and God's favor through the process of repentance – the one "sacrifice" that the Almighty will never reject.